Full Eye Shadow Brush by Mineral Hygienics - Review | Sahrish Adeel - Malaysia based Pakistani Beauty & Lifestyle Blogger! Sometimes we don't feel like using so many brushes for eye makeup especially when we are getting ready with natural looking eye makeup and at times it gets hard to carry so many brushes when we are traveling. Mineral Hygienics presents Full Eye Shadow Brush which can be called a multitasker (if that's a word =P). This is a full eye shadow brush with a solid grip. It has tightly packed but soft bristles made up of sable hair. Nicely picks up the product. Good for loose, cream or compact eye shadows. Can be used to highlight or contour face with precision. Works fine in placing colors and blending it. Works nicely in crease of the eye as well. No shedding of hair during application or at the time of washing. Unlike synthetic brushes, sable hair brushes absorb any cream or liquid product so if not washed instantly, it can remain stained if dark or bright colors has been used with them. I always look for a high quality but inexpensive brush. I also look for a brush that is not at all harsh on the skin and actually have soft feel. With this Full Eye Shadow Brush, I was kind of worried that it will be harsh on the skin like a Full Coverage Kabuki Brush (review) I used by Mineral Hygienics. That was not realy harsh, but felt a bit pinch-y on cheeks, forehead and chin. Thank God this one is really soft on skin as eyelid is a really sensitive area. 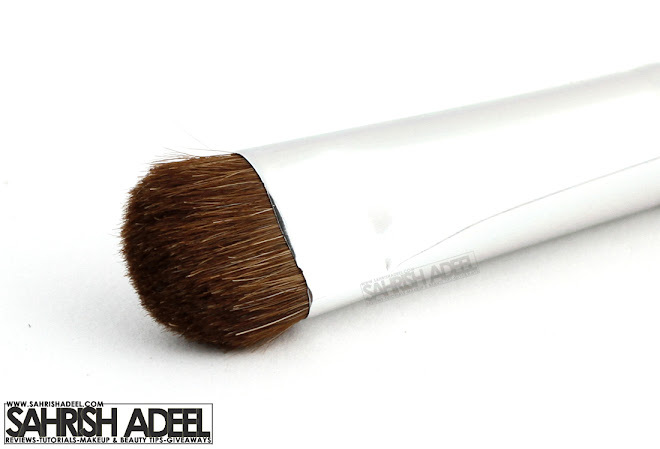 This brush works really fine in picking up, placing and blending eye shadows. I like to use it more for everyday makeup with I need one brush to go with two to three toned eyes for everyday look. If I use a cream product with this brush, I try to wash it instantly or at least wipe it properly with a makeup wipe as it absorbs the product more and it can be stained if the product stays on for longer period. I can't really say that how long it takes to dry. I wash my brush in night and leave them to dry overnight and I never found it wet or damp in the morning. I think I give my brushes about 10 hours to dry on average. I also like to contour my face, especially nose this brush at time (mostly when I am in a hurry). Also works fine to highlight the face. I like the size of the brush, it is not too big for the eyes and not to small as well. Overall, I love this brush. Great quality and looks like a long term tool. I will highly recommend my readers to get this brush in your collection. This is a multi-tasker (again, if that's a word) brush and works pretty great for blending. Get a 20% discount by entering Sahrish at checkout. This coupon is valid for one year starting from Feb, 2013. You will be asked to apply the coupon code at the time of the checkout when you will click on payment detail option. If you have any queries, drop me an email at info@sahrishadeel.com and I will help you in placing your order. This Full Eye Shadows Brush costs $14 and you can buy it from here. Mineral Hygienics ship worldwide. Mineral Hygienics also give their customers reward points on every purchased item that can be utilized on future purchases. Question: How many brushes do you have in your collection? More reviews on products by Mineral Hygienics here. More reviews on makeup brushes here.